Description: I was hoping to get this e/b stack train on Starucca but it was too fast for me. Description: The B 40s were not exempt from yard work. Here we see 4004 working a cut of cars next to the D&H station at QD. Description: An NYSW B 40 leads a pair of D&H units on SLN 4 as it heads for Little Ferry. Over the next ten years, this would be a common sight, with CP and SOO power getting into the act after CP took over the D&H a couple of years later. Description: A short passenger extra heads eastbound past ZINC. Photo by my father Jim. Date is approximate. Description: MEBU rolls through Bevier St on its way to QD and a trip on the Southern Tier. Description: A set of power has come out of East Binghamton and across CR at BD, and will shortly clear the crossovers at the south end of Bevier St. Then it will go back down to QD, reverse and go through town on the Tier to get back to the yard. Guess they really wanted the NYSW B 40 leading. Description: Walter Rich put out a directive when the NYSW started running the D&H that NYSW painted units were to lead wherever practicable. This power set is being turned to get the B 40s in the lead. 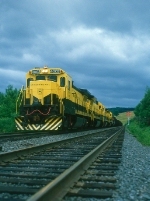 The unit on the other end is a leased GATX GP 38, so its also possible the crew wanted the new unit to run from. Description: Waverly had a pair of signals, one a tri light that HAN 1 is about to knock down on track 1, and a semaphore on track 2. 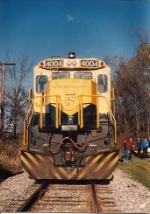 Note the semaphore is showing a stop indication. Description: A B40 and and F45 roll HAN 1 west through Waverly. Description: SLN 4 rolls to a stop, and will get a new crew for the trip to Jersey, the D&H crew having finished their part of the trip. Description: MEBU crosses Moottown Rd and the north end of Dyes siding as it rolls downhill toward Binghamton. Description: MEBU with five NYSW yellowjackets crosses Wylie Creek as seen from NY 235. Description: MEBU rolls through the S curve at Sanitaria Springs, showing off its five yellowjackets. 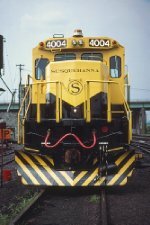 As good as this was, the real prize was in Binghamton on BUOI-an MKT SD40-2. Description: On the north side of town, the action was not all D&H. An RPPY with a couple of NYSW GEs waits to cross Conrail, while their local WABH 11 works over at Agway on the former DLW. Description: NY 10 seen from across the river in Oakland. We get a good view of the viaduct and the surrounding area in this wide view. Description: NY 10 rolls through BD after its crew change, making a run for Gulf Summit and the Delaware Valley. Description: NY 10 rolls east across the West Branch of the Delaware just west of Deposit, seen from the NY 17 overpass. I dont recommend stopping here, but it is a pretty shot. Description: NY 10 rolls east along the Delaware River, with NY 17 on the opposite side of the train. This is one of the reasons this line was so easy to chase. Description: One of my favorite shots on the Delaware Division was an eastbound coming off the big bridge at Hancock. NY 10 heads east in screaming sun on a winter day. Description: NY 10 rolls east through the trees along the Delaware at Basket. Description: NY 10 passes the Erie station at Callicoon just as the sun gets too low for a well lit photo. Time to head back home. Description: NY 10 approaches Schoolhouse Rd in Cascade Valley with 85 stack platforms behind a trio of B 40s. This was quite a climb for 4 axle power with a heavy train, but in that era it was a common sight, as CR and NYSW both used 4 motor units on stack trains. Description: NY 10 heads east along one of the more scenic spots on the Delaware. Today's train is 85 stack platforms.